Objectives: (1) To gain a working knowledge of some of the primary types of modern bridges designed by civil engineers; (2) to improve research skills, including discernment of appropriate professional and academic sources; and (3) to improve writing skills in order to clearly express ideas. Neatness counts. Please read the entire assignment below, before beginning the assignment. Write your answers neatly and legibly. 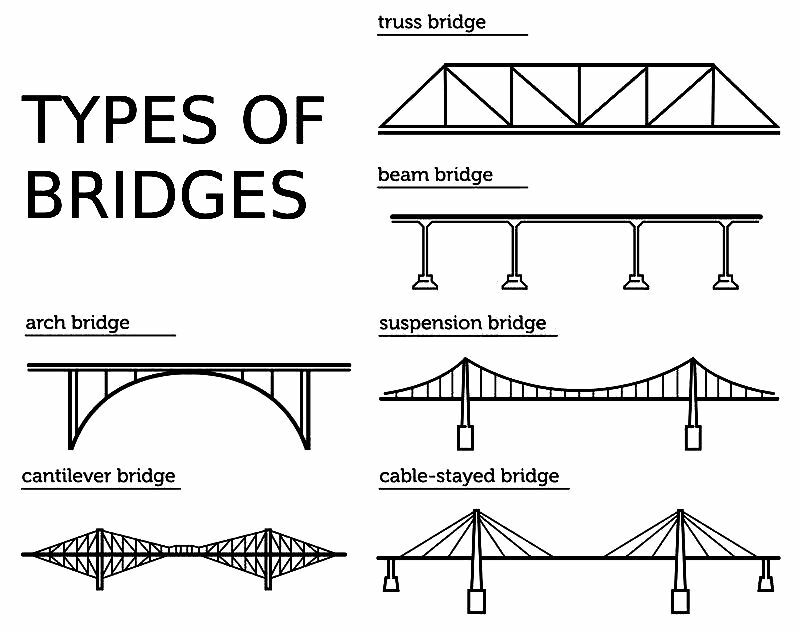 (C) Name the key parts/components of each type of bridge. 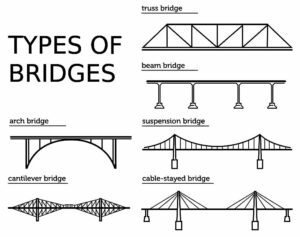 List your sources in brackets; Label these parts/components on your drawing of each bridge type. (E) In what situations would you be likely to recommend using this type of bridge. (E) In what situations would NOT recommend using this type of bridge. (F) Explain how the weight on the bridge deck is distributed to the other bridge components. List your sources in brackets. (G) Provide the names/locations of at least three (3) examples of this type of bridge. Explain in a sentence or two, why this type of bridge was selected for this location/application. List your sources in brackets. (H) Name any subcategories of bridge within the main type. What are the distinguishing characteristics of each subcategory? List your sources in brackets.